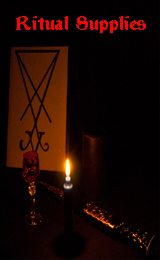 You have found Satan-Supplies, the premier Satanic source for Black Candles, Satanic Ritual Supplies, and Satanic Jewelry and Clothing on the Internet. During the course of your stay, you will find that we are not like most other Satanic and Left Hand Path stores. You will never find RHP symbols or languages incorporated into our products. Here, you will never have to worry if the item you are purchasing is in fact blasphemous to Satan, and you will always know that your item was crafted specifically to honor Satan's name. Our Black Candles are always black as midnight, solid-cored, and made from 100% pure, cosmetic-grade Beeswax. Our Satanic Ritual Supplies are always hand-crafted, ultra-high quality items that will truly do honor to your ritual workings! Our Satanic Jewelry and Satanic Clothing lines are stylish, innovative, and durable enough to let you show where your loyalties lie, every day of the week. All of our items are constructed by Spiritual Satanists, for Spiritual Satanists, and all of our items are constructed to be worthy of bearing Satan's name - a standard we take very seriously. It is our commitment to bring the highest quality products to the Satanists who truly need them, at the very best price possible. So please be our guest and enter our store, where Everything You Need, Satan-Supplies. WE NEED YOUR SUPPORT! HELP US EXPAND OUR CATALOG BY SHOPPING WITH US! WE OFFER FLAT RATE SHIPPING! ORDERS SHIP ANYWHERE IN THE CONTINENTAL U.S. FOR $11.40!